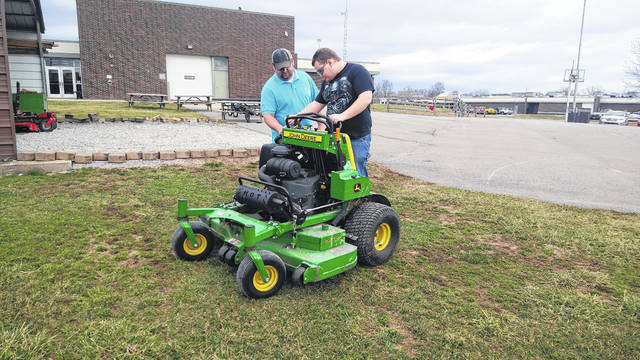 Instructor Kyle Deel (left) teaches a Building and Grounds Maintenance student Shae Beaty (right) how to operate a stand on lawn mower. Roby Harrison muds the intersection of two drywall panels to hide the seam, a necessary practice in finishing the inside of a home. After the material dries it is then sanded down to a smooth finish. RIO GRANDE — In Gallia County, nearly every person lives or works in a building. Buildings, as with all material things, require care and maintenance and sometimes repairs. As Buckeye Hills Career Center seeks to train students for work that is readily available and necessary in our area, the Construction Trades Academy educates students to build, maintain, and repair a wide variety of buildings and their systems. 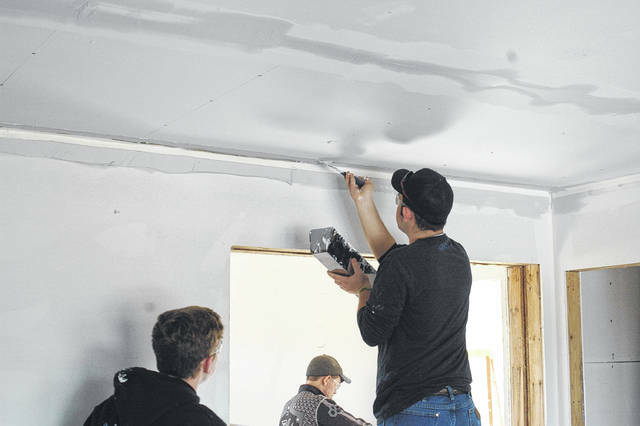 Students in the building trades program have the opportunity to be certified nationally in carpentry and building trades through the National Center for Construction Education and Research as well as Occupational Safety and Heath Administration. Students in the Construction Trades Academy can also enter the Building and Grounds Maintenance program, where they can learn skills ranging from welding and woodwork to gardening and soil conservation. The program is intended to train students to be effective handymen, capable of making basic repairs to common systems and household problems. Students maintain the grounds and facilities at the school for most of the year, which included installing a 250 foot drain to move ground water out from the building. They did this using basic tools they have in their lab. “I like it because you get outside and do more landscaping stuff. My favorite part has been the garden and planting, I’m going to try and find a landscaping job after high school,” said Shae Batey. As with all programs at Buckeye Hills Career Center, visit their website at buckeyehills.net or call them at 740-245-5334 to learn more.